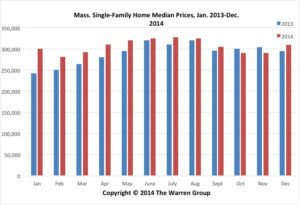 BOSTON, Jan. 27, 2015 –Single-family home sales in the Bay State ended the year with a gain of nearly 10.0 percent in December, marking the largest increase in 2014, according to the latest report by The Warren Group, publisher of Banker & Tradesman. A total of 4,209 single-family homes sold in Massachusetts during the month, compared with 3,841 in December 2013, a gain of 9.6 percent. For the year, sales fell 2.0 percent with 48,963 homes sold compared with 49,992 during 2013. Sales were up 1.4 percent in the fourth quarter, rising to 12,224 compared with 12,058 during the fourth quarter of 2013. Median prices of single-family homes increased by 2.1 percent in December, rising to $320,000 compared with $313,000 a year earlier. 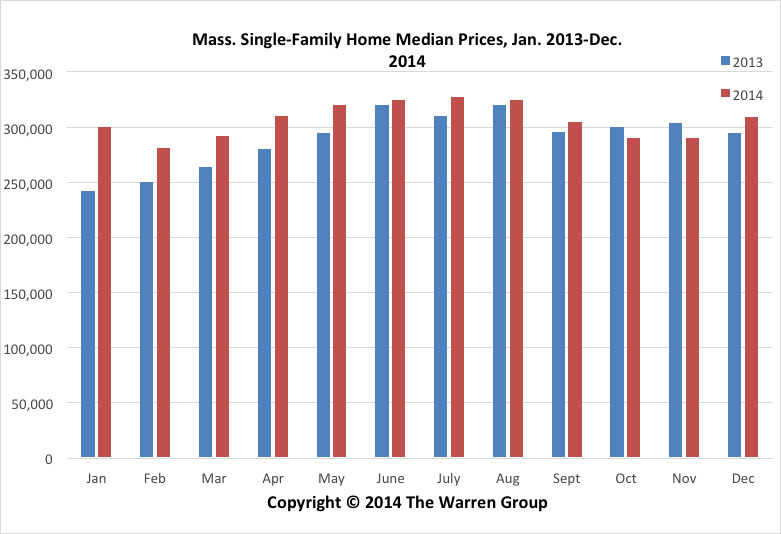 The median price for the full year rose by 2.5 percent to $330,000 compared with $322,000 for 2013. Fourth quarter median prices increased almost 3.0 percent with a price of $320,000 compared with $311,000 in the same quarter last year. Condominium sales statewide decreased almost 8.0 percent in December, marking the fifth time sales decreased year-over-year in 2014. A total of 1,587 condos sold, down from 1,718 in December 2013. For the full year condo sales were up slightly by 0.7 percent, rising to 20,614 from 20,468 during 2013. Condo sales fell by 6.6 percent in the fourth quarter, falling to 4,749 condos sold compared with 5,084 in the fourth quarter last year. The median condo price rose 2.1 percent in December to $309,000, up from $302,593 a year earlier. The full year median price of condos in the Bay State was $310,000, up 4.0 percent from $298,000 a year ago. Fourth quarter condo prices fell 2.1 percent to $295,000 compared with $301,300 during the same timeframe last year.